Although the concept of Islamic Finance can be traced back 1400 years, its recent history can be dated to the 1970s. it is now estimated that worldwide around USD 1 Trillion of assets are managed under the rules of Islamic Finance. 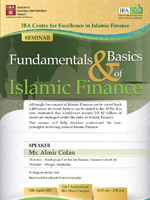 This session will help students understand the basic principles revolving around Islamic Finance.